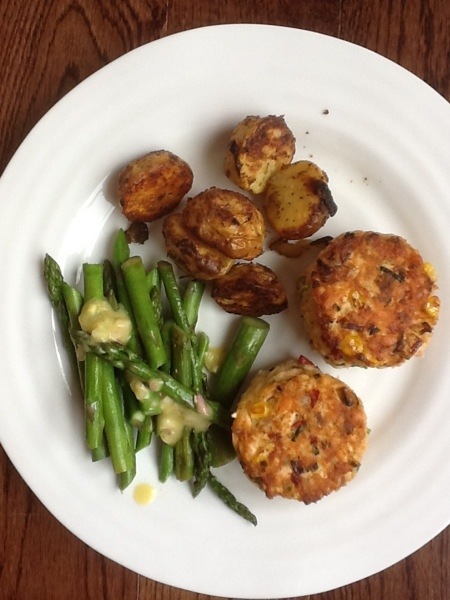 Salmon Cakes, Roasted Baby Potatoes and Asparagus Spears | One Picture, A Million Words. When I was growing up, we always had our dinners at home and it was always in the traditional Chinese style. Every evening, we would sit down to at least three different dishes, a steaming plate of jasmine rice and a bowl of soup to wash it all down. It was great for us but now that I cook my own meals, I can only imagine how stressful it must have had been for the cook to prepare multiple dishes to be served all at the same time. Tonight’s dinner is a departure from what I usually make on weekdays. I make simple one dish meals on weekdays because it is very difficult to cook anything when there are kids yelling for your attention every. single. second. So on weekends, I compensate and try to jazz things up by making meals that are slightly more challenging for the cook, like a dinner that comprises three different components. We had salmon cakes, roasted mustard baby potatoes (I made these a few weeks ago. We liked them so much that they had to be repeated) and sautéed asparagus (I know, not again, but asparagus season is short so we make it a point to enjoy them while we can!) that had a lemon shallot vinaigrette dribbled over. These salmon cakes were so good that I could eat them everyday. They were inspired by a Donna Hay recipe from her book No Time to Cook and were flavoured with lime, lime leaves, red chiles and lemongrass. I could eat them everyday, but I would only attempt to make them on weekends when my husband is home to occupy the kids while I put together our dinner. He is my most trusted babysitter.